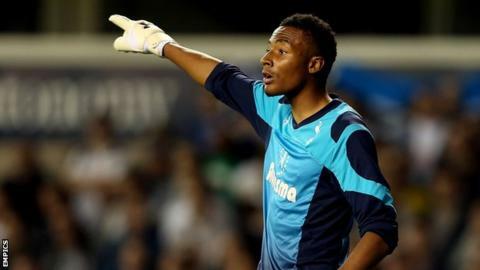 Liverpool goalkeeper Lawrence Vigouroux has resumed his loan spell with Swindon after apologising for paying a fine with one penny pieces. He was sent back to Anfield after using 5,000 coins to pay a £50 fine for turning up late to training. The 21-year-old has played nine games for Swindon after joining them on a season-long loan, with one clean sheet. "Lawrence is going to come back. He is very humble and very apologetic," boss Mark Cooper told BBC Wiltshire. Vigouroux attended Tuesday's 2-2 draw with Doncaster Rovers and could now come into contention for selection for Saturday's game at Blackpool. And he also made a public apology on his social media account on Wednesday, saying: "I would now like to put this business behind me and express my gratitude for being given another chance"
"He knows the way he behaved was wrong and he has been in the changing room after the game and apologised to the players," Cooper said. "He asked them if they wanted him back and they all said yes. Lawrence is an exceptional young goalkeeper and it's important he learns from this little mishap and it will benefit his career going forward." Asked about the nature of the issue, Cooper confirmed: "It did happen and I thought it was brilliant banter, but in the context it was the wrong way to go about it. "We are giving him a second chance and I'm sure he will be grateful."